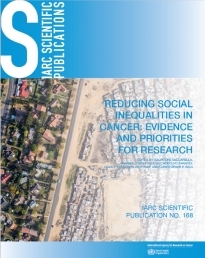 This volume summarizes the current scientific evidence and identifies research priorities needed to decrease social inequalities in cancer. The publication, based on the expert knowledge of more than 70 international scientists from multiple disciplines, undertakes a populations-within-populations approach, highlighting the large variations in cancer incidence, survival, and mortality that exist between countries and, within countries, between social groups. Several factors may lead individuals with low social status to adopt unhealthy behaviors, to be exposed to a wider range and a higher intensity of cancer risk factors, and to have reduced access to health-care services, compared with their fellow citizens. A special focus is given to how the phenomenon of inequalities in cancer evolves and is reshaped over time, driven by economic, social, political, legislative, and technological forces; it affects everyone, but the most disadvantaged individuals are particularly hard hit. This IARC Scientific Publication was developed to serve as a reference for policy-makers and public health officials, linking to specific examples of interventions that may reduce future inequalities in cancer.